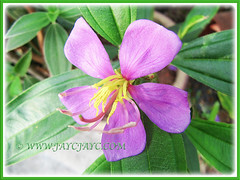 This beautiful shrub produces purplish-pink or deep mauve and white flowers. 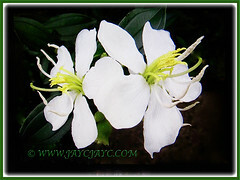 The attractive white blooms are somewhat rare as compared to the purplish-pink ones. 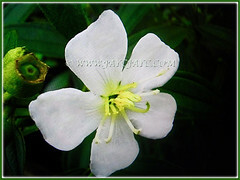 The white-flowered variety is known as Melastoma malabathricum ‘Alba’. We first caught sight of the white flowers at a garden nursery in our neighbourhood in the year 2014. Since then, we come across them every now and then along the roadside, highways, countryside, home gardens and parks. 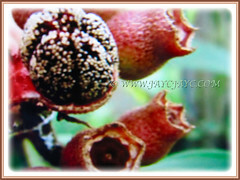 Botanical Name: Melastoma malabathricum (syn. : Malabar melastome). 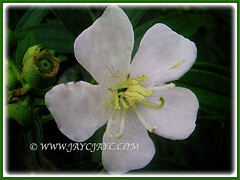 Common Names: Malabar melastome, Indian/Singapore/Straits Rhododendron, Common Sendudok, Malbar Gooseberry. Etymology: The genus name Melastoma is derived from the Greek word black mouth, referring to the dark-coloured pulp. Origin: Native to Southeast Asia including Singapore and Malaysia, Coastal regions of the Indian Ocean, China, Taiwan, Australia and the South Pacific. It is also widely cultivated worldwide. Features: Melastoma malabathricum is a species of the genus Melastoma that comprises of about 50 species of flowering plants. 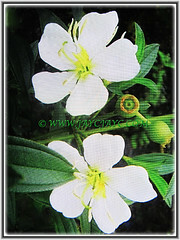 A small perennial shrub or tree that usually grows to approximately 1 meter in height. Its leaves are long, narrow and pointed at both ends, with 3 distinct ribs. The leaf’s underside are rough with fine bristles. Flowers are produced year round though they open only for a day with petals falling off a few days later. 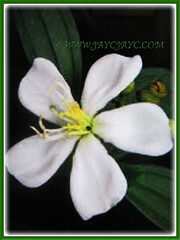 The five-petaled flowers, measuring between 5 -7 cm across, are produced in a cluster at the end of a branch. Flowers come in deep mauve and in white, the latter colour being somewhat rare. Eventually the flowers will develop into berries when ripe and reveal the soft, dark purple edible orange seeds that stain the tongue black. The fruits of mauve-coloured flowers are reddish brown while those of Melastoma malabathricum ‘Alba’ have green coloured rind. 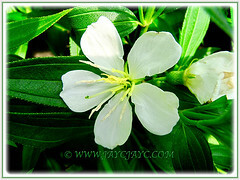 Culture (Care): Melastoma malabathricum is a fuss-free shrub that can be easily grown with least care. Moisture: High water requirement. Water regularly and keep soil moist especially during the hot seasons. Do not allow soil to dry out between waterings. Soil: Best in fertile, friable and loamy soils. It can tolerate any type of commercial garden soil with good drainage. Others: Remove withered leaves to maintain tidyness. Prune back the plant to shape them. Since it is self-seeding plant, remove spent flowers promptly or deadhead to limit fruit and seed production. Feed once a month with a general fertiliser to promote healthy growth and encourage flowering. Generally free from pests or diseases. Since it is a host plant for certain butterflies, there will be some damage to the foliage. 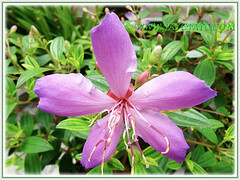 Melastoma malabathricum or Singapore/Straits Rhododendron can be grown as a perennial plant in container gardening or in the ground, either outdoors or indoors. It self-sows readily, thus deadhead if you do not want volunteer seedlings next season. It is regarded as a noxious weed in certain regions of the world. Propagation: Easily from seeds if taken from fresh mature fruits. A faster way to propagate is from stem cuttings. 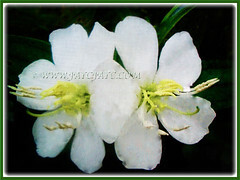 Usage: Melastoma malabathricum that produces white flowers that are rare will be excellent in any garden. An ideal ornamental shrub for container gardening or raised planters. Grow this captivating plant to add colour and beauty to your garden beds or borders. Suitable too as a showy landscape shrub. If you are a nature lover, plant it to attract birds such as the Yellow-vented Bulbuls, butterflies, squirrels and monkeys that love the fruits. In Java, the sour young leaves are eaten with food while the leaves and roots are used in traditional treatment of diarrhoea and dysentery. The roots are also used as a mouth-wash for toothache. Berries of Melastoma Malabathricum ‘Alba’ ripe into orange colour seed. It does not stain your tongue as the purple seed.